Hackney Wick is virtually unrecognisable from its pre-Olympics self. When I moved in to Queen’s Yard almost six years ago, there were few bars and restaurants. Now it is a bustling centre for boozing. But with the London Legacy Development Corporation’s regeneration plans coming to fruition, this stretch of canal has been transformed into highly desirable real estate, with a glut of canal-front restaurants opening. I visited three of them to investigate. On a sunny day, all of these places have outdoor seating in lush greenery, making it a perfect place to linger with a beer. 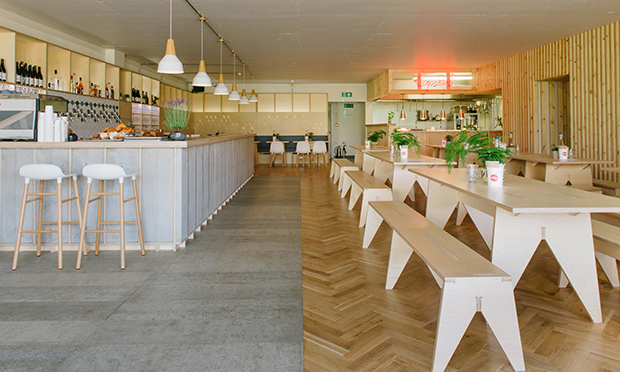 The Breakfast Club, which started out in Islington, is like a TGI Fridays for the younger set. It is a cheerful destination that serves American-style breakfasts, heaping piles of nachos and a range of cocktails. At brunch I had the chorizo hash, which was perfectly serviceable, and my friend enjoyed her vegetarian sausage sandwich. Later, to see what it was like in the evening, two of us attended a boozy bingo night, where a girl dressed as a grandma demanded that the bar staff bring out shot after shot of sours for the players. It was slightly corporate for my tastes but unpretentious fun nonetheless, and a great place to go with a group of friends or colleagues for a knees-up. When I heard Mason & Company’s premise – craft beer – I was dubious. The Wick already houses three breweries after all. It is, however, worth a visit. From the owner of the Five Points Brewing Company, this is a glossy bare pine venture with industrial motifs. The beer menu includes rare and limited edition brews from around the world, and whilst some half pints cost as much as £5, the selection is exceptional, with up and coming breweries such as Siren as well as local favourites Beavertown and The Kernel. Heading up the food is former Kerb regular Capish? with items like deep fried spaghetti balls and meat loaf corn dog. The menu seems to be a parody of traditional Italian-American fare and was too rich for my tastes, although would serve as good ballast for extended drinking. Over two visits I tried most of the menu: the aforementioned spaghetti balls were forgotten by the server and never made it to my plate, but the steak sandwich stood out, tender and melting and topped with taleggio cheese. And for vegetarians the aubergine parmigiana was a fine option. 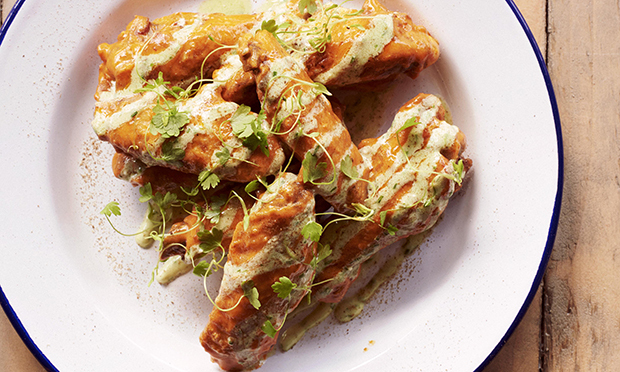 My favourite among the new arrivals is Randy’s Wing Bar. It was formed by Richard and Andy, two street food graduates with a family connection to a Norfolk chicken farm. “They couldn’t give the wings away,” Richard explained, and thus a business idea was born. Like the previous two restaurants, the menu is predominantly American-inspired, with chicken wings, popcorn shrimp, fries and cocktails. The atmosphere is unpretentious and inviting. We had a taster of wings, which include the classic Buffalo and Kansas styles, as well as Gangnam (Korean style), Bombay and Hanoi (a fish sauce recipe akin to the one from the famous street food outlet Pok Pok). Curiously not the only place in this line-up to serve chicken scratchings, it seems like the perfect local joint for a cocktail and snack, where I might head to unwind with friends after work.